In Pepsi's new ad, model Kendall Jenner joins a protest march and hands a soda to a police officer. Following a widespread backlash, the company announced on Wednesday that it would halt a wider rollout of the video. It was about unity, Pepsi explained. But the company's new ad, set at a protest march, was quickly called out for being tone-deaf, offensive, and perhaps worst of all for the brand: not "woke." The ad, which stars model and Kardashian sister Kendall Jenner, had been slated for a worldwide release. But Pepsi announced today that it would halt any further rollout of the ad. "Pepsi was trying to project a global message of unity, peace and understanding," the company said in a statement received by the Associated Press. "Clearly we missed the mark, and we apologize." The company removed the ad from its YouTube channel on Wednesday afternoon, where it had garnered at least 1.3 million views in two days. At least for now, the ad – all two minutes, 39 seconds, is still viewable on Jenner's YouTube channel. The ad features a diverse cadre of young, happy protesters holding signs splashed with calls for peace, love, and in one odd instance, to "Join the conversation." 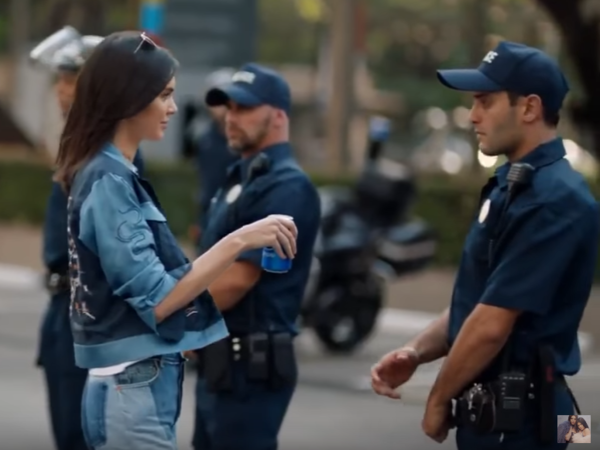 In the ad's key scene, Jenner hands a can of ice-cold Pepsi to a police officer, who accepts it and takes a sip, to raucous cheers from protesters. In general, Pepsi was accused of trying to sell soda using the setting and symbolism of recent protests, such as those against police brutality. AdAge reports that the spot was created by Pepsi's in-house creative team, Creators League. The company initially stood behind the ad. Earlier, Pepsi told Adweek in a statement: "This is a global ad that reflects people from different walks of life coming together in a spirit of harmony, and we think that's an important message to convey." The soda company may not be the last brand to try to invoke the protests and "resistance" ethos that are hallmarks of this political moment. But this ad may be one textbook example of what not to do. It didn't even take a day for Pepsi to dump its new ad campaign. It started with a video that seemed pretty standard at first - crowds drinking Pepsi, break dancers, high fives - then model Kendall Jenner appears, transforming, shedding her slinky dress and blond wig to join a street protest. SKIP MARLEY: (Singing) We are the lions. We are the chosen. We gonna shine out the dark. So Pepsi seemed to be trying to play to a diverse demographic, including featuring a Muslim woman in a headscarf portraying a photographer. But the backlash against the ad has been swift. Here is how it immediately struck Elahe Izadi, who writes about pop culture for The Washington Post. ELAHE IZADI: I swear to you, at first I thought it was parody. I mean, I just couldn't believe how they were able to mash in all of these cliches into two minutes. MARTIN: Pepsis said in a statement that the intent of the ad was to send a, quote, "global message of unity, peace and understanding." In the video, marchers held blue signs that read love or peace or join the conversation. Kendall Jenner approached a police line and handed a Pepsi to a smiling officer. GREENE: And many saw that as an insult to the Black Lives Matter movement. And Bernice King, daughter of Martin Luther King Jr., tweeted (reading) if only Daddy would have known about the power of Pepsi. Some others denounced the ad as anti-cop. Elahe Izadi says the message wasn't clear. IZADI: It can be tricky to use a protest movement to sell a commercial product, but when it's kind of hinting at something, maybe Black Lives Matter or the kind of anti-Trump resistance - capital R - but not quite doubling down, then it just becomes completely tone deaf. MARTIN: Pepsi quickly apologized, both for the ad and to Kendall Jenner. The company said it did not intend to make light of any serious issue. (SOUNDBITE OF ELAQUENT'S "PERCHANCE TO DREAM") Transcript provided by NPR, Copyright NPR.